WHAT DOES BEING RECOGNIZED AS A PUBLIC UTILITY MEAN? Action contre la Faim was recognized as a Public Utility in 1994, but what does being recognized in this French legal form mean? It is the French Council of State who recognizes in compliance with French Law that an Association has the legal form of a Public Utility. Above all, the Association must serve a public benefit purpose, be democratically run as well as having a not-for-profit and solvent financial management infrastructure. This recognition means that the Association has access to certain advantages, such as being able to receive donations and bequests without incurring any income tax liability. Likewise, an Association declared as a Public Utility is also subject to more administrative controls by law and can have this recognized legal form taken away from them when deemed necessary to do so. WHAT ARE ACTION CONTRE LA FAIM MISSIONS? In the main, Action contre la Faim’s vocation is out in the field, concentrating on health, food security, water and hygiene, and organizing testimonial-type awareness and advocacy campaigns. This is done through emergency operations (with the objective of giving aid to the basic needs of the most vulnerable communities) as well as post-crisis programs on a more long-term basis. For more information about our missions visit: our missions. WHERE DOES ACTION CONTRE LA FAIM GET ITS FUNDING? 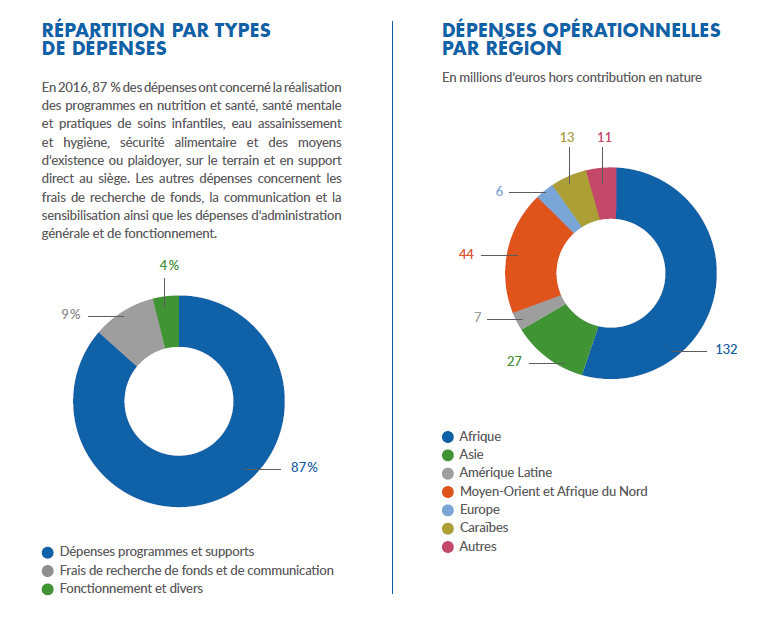 In 2016, 70% of Action contre la Faim funding came from institutional donors, 26.4% from private donations, and 3% from other fund-raising products. In addition to these financial resources, Action contre la Faim counts on the help of numerous volunteers, whether based at Head Office or regionally thanks to the support received from their delegations. Lastly, Action contre la Faim receives substantial in-kind donations for the sum of €8.7M. HOW ARE THE RESERVE/SURPLUS FUNDS MANAGED? Action contre la Faim is an Association constituted in accordance with the French law of 1901 concerning non-profit organizations which means that it cannot exercise the right to pay its shareholders. However, it can generate a surplus (known as profits in the for-profit world) for the Association. This financial situation is essential to an organization such as Action contre la Faim because not only does it enable them to quickly mobilize their funds in the case of an emergency (a natural disaster for example) but also have enough funds available to cover the closure costs of the same (salary payments to staff, …). Reserves make the Association independent as well as remaining operational effective if funding from sponsors or private funding were to drop. In this way Action contre la Faim can finance activities that sponsors do not provide funds for or unexpected events. I WANT TO SUPPORT ACTION CONTRE LA FAIM. HOW CAN I HELP? Chose the amount you wish to donate and the frequency you wish to make your donation. Please note that the minimum amount is €5. You will receive a tax receipt each year for tax returns. Bequests and donations you can make a donation or bequest. For more information click here. Solidarity Events : you can raise funds at a personal function (birthday, marriage, etc.). For more information, contact the Service Office by clicking here. Luncheon Vouchers : you can donate your luncheon vouchers to fight against hunger. For more information visit Je dej’ je donne. Our Foundation : you can help Fondation Action contre la Faim in the area of Research and Innovation by clicking here. You are entitled to receive tax relief on your donation to the Action contre la Faim Foundation in compliance with the French taxpayer’s scheme on solidarity tax on wealth tax (known as ISF in French) for up to 75% of the amount and up to a limit of €50,000. HOW CAN I BE SURE THAT MY DONATION IS USED EFFECTIVELY? Action contre la Faim is committed to rigorous, transparent management of donations. Furthermore, the Association is a member of the Committee of the Charter for Trust in Fundraising (known as Charte du Don en Confiance in French), an organism that checks and approves associations who appeal to public generosity. The Committee has prepared a Code of Ethics and gives its consent to organizations who voluntarily commit to respect and be subject to their controls. You can find more information here and in our Annual report 2016. WHAT IS THE DIFFERENCE BETWEEN THE DONOR AREA AND THE MEMBER AREA? Whether you make one-off or regular donations, you access your donor area where you can query the history of your donations, modify your personal information (postal address, telephone number, e-mail, etc.) and print duplicate tax receipts. You can only access the member area if you are a Member of the Association paying a yearly subscription and participate in activities of the Association such as the General Assembly. For more information. HOW DO I CREATE MY DONOR AREA? If you donate to Action contre la Faim, you have the option to create your Donor Area. To do this, all you have to do is click https://dons.actioncontrelafaim.org/inscription.php and register by completing the fields as indicated without any special characters (replacing the dashes and apostrophes with a space). I DO NOT KNOW/CANNOT FIND MY DONOR NUMBER. WHERE CAN I FIND IT? The Donor Number is a series of 5 to 7 numbers that can be seen at the top of your personal information, included in our letters or in the subject of our e-mails. This number is located to the left of the code beginning with the year and then a letter (e.g. 17F…). You can also find it on your bank statement if you are paying by direct debit. I AM HAVING DIFFICULTY CREATING MY DONOR AREA. You are in the Member Area and should be in the donor area. Your first or last name include special characters (accents, dashes, apostrophes, etc.) that the software does not recognize. Please delete them and replace them with spaces. Your registration has not yet been entered in our files because it is so recent. Please wait until you receive your tax receipt or confirmation letter/e-mail of receipt of your donation to activate your area. If you have a double-barreled family name please refer to the last letter/e-mail sent to you by us. If you are married and you cannot register, try again but with the name of your partner. – If you have moved, enter the postal code of the place where you lived before. In the case that your problem is not resolved, please contact the Donor Relations Service from Monday to Friday from 9h to 13h and from 14h30 to 18h on +33 01.70.84.70.84 or by e-mail at service.donateurs@actioncontrelafaim.org or complete the contact form. All you have to do is click on this link and enter your User Number or e-mail address that you sent to us when you created your donor space. DIRECT DEBITS AND CHANGING YOUR BANK INFORMATION. HOW CAN I CHANGE MY DIRECT DEBIT DONATION? If you wish to increase the amount of your donation, please access your Donor Space and go to the My Donations section. For any other modifications, you can contact us either by phone from Monday to Friday from 9h to 18h on +33 01.70.84.70.84 or by completing the contact form in your donor area. WHEN DOES THE DIRECT DEBIT GO OUT OF MY ACCOUNT AND CAN I CHANGE THE FREQUENCY? Direct debits go out of your account on the 5th or on the 15th of the month. You can modify the due date (monthly, quarterly, or other) by contacting us using the contact form or by phone on +33 01.70.84.70.84 if you have selected payment by direct debit. For Credit Card or PayPal direct debits, the due date and the donation amount cannot be changed. I WANT TO STOP/SUSPEND MY DIRECT DEBIT. HOW CAN I DO THIS? We would like to thank you most sincerely for the support you have given us in assuring the sustainability of our missions. However, we completely understand that circumstances can make it difficult to make donations. We can also offer you different ways of giving. You can reduce the amount of your direct debit (to the €5 minimum), modify the frequency (quarterly, yearly, or other) or put your direct debit on hold for a while. If you want to modify the terms of your direct debit or discontinue the same, please contact us by phone from Monday to Friday from 9h to 18h on +33 01.70.84.70.84 or by completing the contact form in your donor area. Please note that any modification to direct debits must be submitted 10 days before the date the direct is due to go through at the very latest so that the same can be applied. WHAT TAX RELIEF AM I ENTITLED TO WHEN MAKING DONATIONS TO ACTION CONTRE LA FAIM? Each donor has the right to tax relief on up to 75% of the donated amount, up to a limit of €531. If your donation is more than €531, a tax relief of 66% is applied to the difference, up to a limit of 20% of your taxable earnings. Above this limit, you can carry forward your donations for 5 years of the accumulated amount to take advantage of the tax relief under the same conditions. For more information, do not hesitate to contact our Donor Relations Service from Monday to Friday from 9h to 13h and from 14h30 to 18h by phone on +33 01.70.84.70.84. WHERE DO I DECLARE MY DONATIONS TO ACTION CONTRE LA FAIM ON MY FRENCH TAX RETURN? On your Tax Return, enter your donation in the 7UD box. If you have donated more than €531, enter your donation in the 7UD box and enter the difference in the 7UF box. WHEN DO I RECEIVE MY TAX RECEIPT? For a one-off donation, the tax receipt is sent 8 to 10 days after its payment. If you make your donation by direct debit, you will receive the tax receipt for the same during the first quarter of the following year. I HAVE MADE A DONATION (BANK CARD, CHECK, DIRECT DEBIT, ETC.) TO ACTION CONTRE LA FAIM IN MY NAME FOR ANOTHER PERSON. CAN A TAX RECEIPT BE ISSUED IN THEIR NAME? It is possible to put the tax receipt in the name of the person if the same is part of your foyer fiscal (in France this is known as a taxable household or common tax return). If this is not the case, unfortunately we cannot put the tax receipt in the name of this person since the Tax Authorities force us to issue the tax receipt in the name of the person issuing the check or the person who owns the account and the donation has to be a beneficiary of the same. HOW CAN I GET A DUPLICATE OF MY TAX RECEIPT? Please do not forget to tell us how you wish to receive your duplicate (post or e-mail). I HAVE MOVED AND WOULD LIKE TO INFORM YOU OF MY NEW ADDRESS. WHAT DO I NEED TO DO? HOW CAN I KEEP UP-TO-DATE ON YOUR ACTIVITIES WITHOUT RECEIVING PAPER-BASED INFORMATION BY POST? To be informed of our activities without receiving paper-based information by post, you can subscribe to our Newsletter directly on our website when you click here. WHAT IS DOES CNIL STAND FOR? If you are not an Action contre la Faim donor, please do not forget to provide the code beginning with 17P that can be found in one of your mails. HOW CAN I MAKE SURE THAT MY PERSONAL INFORMATION IS NOT GIVEN TO OTHER ORGANISMS? Do you have a query about your donations? The Donor Relations Service is at your disposition from Monday to Friday from 9h to18h on +33 01.70.84.70.84. For any other requests, call our general number on +33 01.70.84.70.70 from 9h to 13h and from 14h to 18h.